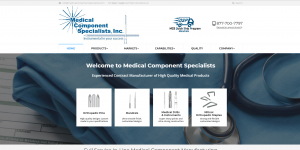 At Medical Component Specialists (MCS), we know that our products are instrumental to your success. We operate as a full service in-line medical manufacturer specializing in high-quality orthopedic pins, mandrels, medical drills and instruments, and nitinol orthopedic staples. What sets us apart from the rest? We flawlessly incorporate 21st century technology with a legacy of craftsmanship, and we believe quality to be of the utmost importance. To that end, we have obtained ISO certification and designation as an FDA registered facility with full lot trace-ability. With our high-speed Swiss CNC equipment, precision grinding capabilities and flexible finishing options, we are able to consistently produce expertly crafted instruments with quick turnaround times. Our medical-grade instruments feature ultra-sharp hollow points to minimize the force of insertion, as well as a superior cutting edge to help prevent cell necrosis. Additionally, the super smooth finish helps ensure easy removal post-surgery. As a leading orthopedic pins manufacturer, we offer K-Wires, Steinmann pins, and Trocars. We also provide specialty pins (including olive, knowles, threaded, and more) and orthopedic guide wires in stainless steel or Nitinol. Our wide variety of available points, markings, and threading guarantee that you will find the appropriate instrument for your medical needs. We offer made-to-order mandrels, as well as stock mandrels available for quick shipping. The mandrels manufactured by MCS cover it all, from short and long tapers to brazed assemblies and hollow tubes, while a variety of materials will provide you with the right mandrel for the job. In order to properly penetrate bone, MCS’ medical drills and instruments have been specifically designed for both sharpness and strength. Our drill bits, taps, screwdrivers are of exceptional quality, and our customizable assortment of heat treatments, flute geometries, laser markings and more will provide you with the perfect precision instrument. Our nitinol staples are designed to be strong, flexible, and adaptive. Each staple features rounded edges to reduce patient discomfort. With our superior instruments, we service several markets, including orthopedics, minimally invasive surgery, and interventional therapies. Looking for a custom instrument? We offer custom design and manufacture solutions to meet your specific requirements. Contact Medical Component Specialists today to get a quote and discover the MCS difference.